Nothing can be worse than nippers, clippers and scissors being out of condition and then having to send them overseas for restoration – expensive and disruptive. The AF/ CAN Honing Machine is especially designed for hairdressers and barber salons. The clippers are honed ‘sharpened’ thoroughly checked for any repair and lightly lubricated. 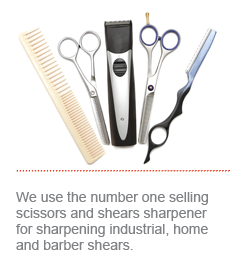 We use the number one selling Scissors and Shears Sharpener for sharpening industrial, home, and barber/grooming shears. Wolff’s Professional Twice as Sharp® machine is designed to make sharpening the customer’s shears fast, easy, and precise. We also use clipper shacks nipper sharpening system to effectively sharpen and correct all types of nipper problems.